Nitish Verma reports on Professor Farrell’s talk on The Irish Constitutional Convention, an initiative set up by the Irish government in 2012 to consider a number of potential constitutional reforms. 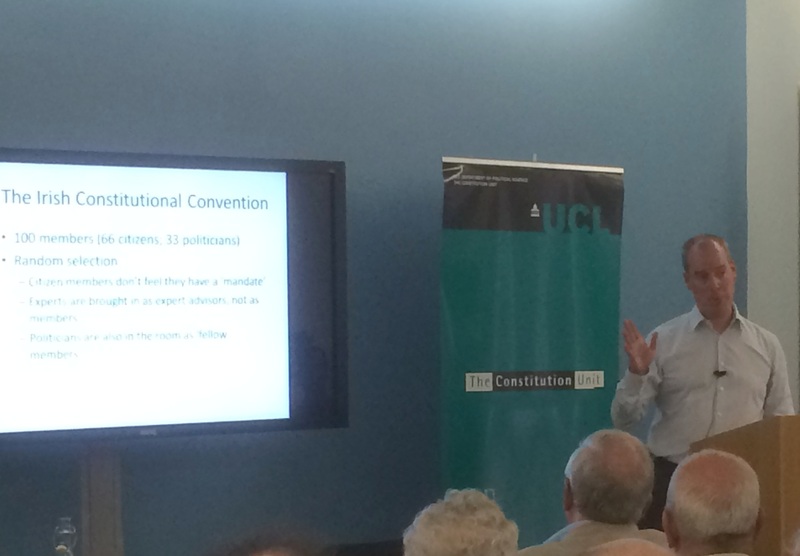 Speaking at the UCL Constitution Unit Seminar on 21 May, David Farrell, Professor of Politics at University College Dublin and Research Director to the Irish Constitutional Convention (ICC), provided an inside view of the origins, workings, and legacy of the Convention. Established in June 2012, the ICC was tasked with proposing recommendations regarding a variety of constitutional and social issues facing Ireland, and relied upon the involvement and engagement of ordinary citizens as members. This process was unique, according to Professor Farrell, as it represented a ‘third way’ of constitutional design, with representation achieved through random member selection, and legitimation via a combination of institutional ratification and popular vote. According to Farrell, the establishment of the ICC was motivated by two factors: the severe economic crisis afflicting Ireland in 2011, and the subsequent general elections later that year. The timing of these elections was, in Farrell’s opinion, fortunate as it produced an incoming government that was committed to enacting substantial constitutional, political, and economic reforms. More importantly, this opened the door for Irish political scientists to play a crucial role in ‘steering’ public discussion in favour of a citizens’ assembly. As a result, in May 2011, a group of independent researchers and academics, including Professor Farrell, established We the Citizens, a national initiative aimed at illustrating the potential benefits of involving the public in political decision-making. In engaging citizens across the country, the initiative demonstrated ‘statistically significant’ results, proving that randomly selected citizens were not only interested, but also capable of deliberating on the complex political and constitutional issues facing Ireland.